Pet Sitting has been proven to be a great recession-proof, low start up capital business. Are you ready to start your own successful pet sitting/horse sitting business and be your own boss? If so, you are at the right place. We have provided you with all you will need to be set up for success. Below you will find professional and extrememly user-friendly horse/livestock sitting business forms which were designed by a professional pet sitter and have been tried and tested for over 7 years. With your purchase you will receive a free instruction manual on how and where to use your forms, free lifetime business support (have a question, ask us), free lifetime business listing in the Professional Pet Care Directory and an invitation to join PetPro (a free support group for pet sitting business owners). With these resources plus the articles on starting and running your pet sitting business, you have all you will need to run a successful pet sitting business. 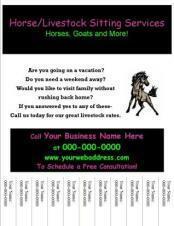 Below are the forms you will need for your horse sitting business. To see a sample of the forms, click the name of each form listed below. A package designed specifically for those sitting horses and/or other livestock.� Includes all the paperwork you would possibly need.� A total�of�16 personalized forms for�one�low price!! !� Click the link for more info about what is included in this package. Your clients will be glad to see how well-prepared you are when you have them sign this well-designed,�personalized horse sitting service�agreement. These sheets are�a guide to help you and your client�provide the necessary information�to take care of your client's horses and livestock as well as their home. Keep your clients updated by providing them with daily information on the care of their animals.